The Surfside Beach Pier (South Carolina) stands stoically as the the tide rolls in. Looking at it in real life, you'd probably think it looked neat, but not this epic. That's because your eyes are so much better than a camera sensor. Let's walk through the differences visible here. 1) The lights looked white in real life, not green. Our eyes color correct a lot of light sources to white - they even correct mixed light sources, such as daylight mixed with tungsten, to white. Camera sensors can't. As far the sensor is concerned, there's 1 color temperature (expressed in degrees Kelvin or Kelvins) that's neutral, and any light source that's not that color ain't white (usually bluer, oranger, yellower or greener), despite what your eyes tell you. Here's a color temperature chart that lays it out nicely. Note that fluorescent lights generally come with a side of green tint that isn't reflected in that chart. 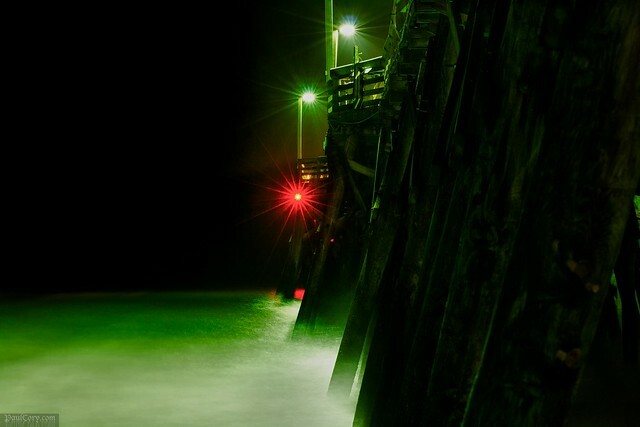 Here, those lights on the pier, except for that red one at the end, are pumping out light that looks green to a camera set for daylight color balance. I could have corrected this by changing my color balance to fluorescent on the camera, or on the computer (in post), but didn't. I saw what was happening as I reviewed the photos I was taking as I moved up the beach towards the pier, and liked the effect. 2) The sea had surf with distinct waves, not the smooth, misty, mystical water you see in the photo. Pier lights seem bright to our eyes, but to the camera sensor, they are damn dim. This is a 2 minute exposure at f/11, ISO 100. That's approximately 15 stops less light than on a sunny afternoon. In other words, those pier lights are 1/32,768th as bright as the noon sun. Two minutes is far too long a shutter speed to stop any sort of motion. Thus, the waves disappear, their white tops recorded only as white mist clinging to the timbers of the pier. Likewise, the water goes smooth and silky. 3) In person, it doesn't seem so immense - it's big, but not the way it looks here. The last divergence from what the eye perceives is the result of the compressed perspective offered by the 100mm lens. Since the 60D has a 1.6 crop factor, I effectively shot this with a 160mm lens. That telephoto perspective allowed me to stack the support timbers visually to create an illusion of massiveness. Obviously, I used a tripod to get this shot. I also used a remote shutter release and mirror lockup to ensure that there was no shake at all. In post, I struggled to get this where I wanted. Straight out of the camera, the tonal range was extremely compressed. Expanding it to make the black night sky black, without losing all the detail in the support, and keeping everything looking coherent, was a real challenge. I ended up turning to HDREfex Pro make it happen. Yes, I used HDR software with a single exposure, so I could access the tone mapping tools. It did exactly what I wanted, and a little more. It punched up the green color more than I had intended, but I decided I really liked the look. Nothing but afternoon light broken up by a wooden structure, a beautiful woman, and 100mm lens at f/3.2, really tight.